Improvements to Jevington Village Hall along with a new access and car park have been unanimously approved. Trustees of the Grade II listed building are looking to make a number of alterations including a new glazed entrance to the rear, removal of internal partition walls and the replacement of an existing lean-to extension to provide accessible toilet facilities….The other major part of the plans will see a new access constructed from Jevington Road, car park with level access to the hall and a paved pedestrian access. A planning application for the works was approved unanimously by the South Downs National Park Authority’s planning committee today (Thursday January 17). One of the trustees explained how the hall’s Achilles’ heel was its access with no car park within easy walking distance and steep steps putting prospective users off. While a number of committee members raised road safety concerns about the proposed access, they also spoke strongly in favour of the benefits of the proposal. Doug Jones said: “I think it’s a delightful little scheme, I think it’s great such regard has been given to the sensitivity of the listed building. The Hall is still available to hire as we will have a lengthy period of fund raising now we have obtained planning permission. On 31st December 1846 William Cavendish Earl of Burlington and heir to the Duke of Devonshire conveyed land in Jevington to the rector and churchwardens for a site for a school and schoolhouse. Before this the parish clerk held a small school in the Saxon tower of the parish church. A small school was built high on a bank beside the main street and opened 6 June 1847. 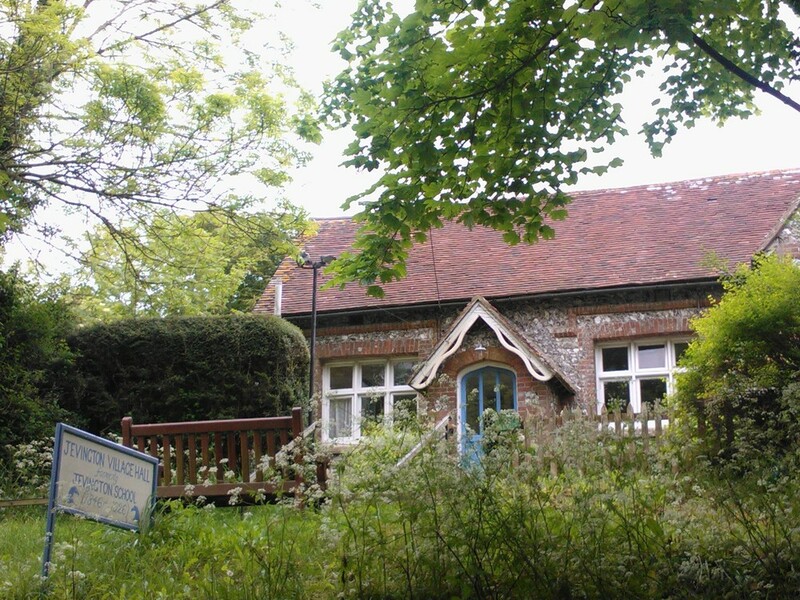 Today the Village Hall is at the center of the village, high on the downs in the South Downs National Park. It is positioned close to the South Downs Way above Eastbourne in East Sussex. The Hall offers a large open room, kitchen, toilet, flexible modern lighting, piano and garden. It is regularly booked as a refreshment stop for organised events on the South Downs Way as well as for dinners, parties, classes, exhibitions and social events. Each year the children at the school celebrated May Day with a ceremony of crowning the May Queen and dancing round the Maypole. They picked flowers from the surrounding downs to make garlands. Here the whole school is pictured on May Day 1923, three years before the small village school closed. Christobel Cuthbert is the May Queen and sitting in front of her is Robert Newson three year old son of the school mistress Florence Newson. Florence, a widow, was the last school teacher at Jevington School and emigrated to Australia with her son a few years later. The Hall is an attractive and versatile venue ideal for any social or business occasion, accommodating up to 100 people standing or 50 people seated. Please visit our booking page for more information on booking the Village Hall. Situated on the path between the church and the village hall, these gates are unique to Sussex churches and only six still remain - three in the neighbouring downland parishes of Jevington, East Dean and Friston. It was adopted as the official logo of Willingdon & Jevington Parish Council in 2000. Thomas Dimmer Schoolmaster 1873-1882 formed a Fife and Drum Band in 1877. He is pictured here with the boys in their smart scarlet and black uniforms. They wore red sashes and peaked caps with a red rosette and button on the top. Twice a week Mr Dimmer marched them four a breast up the main street village. They were successful in winning several local competitions. "Jevington folk are very proud people. They sold their bells to mend their steeple. And before they are left in the lurch, they would sell their steeple to mend their church". The Eight BellsA 300 year old pub at the heart of the village. The children of the village celebrating VE Day in 1945. Jevington Village Hall has been part of the history of the village for over 150 years, and we hope for many centuries to come.